As I write this page, it is mid-winter, albeit a pretty mild one, so gloves have made their way back in to my pack. This page is a brief glance over the hand coverings that I have used over the past fifteen years or so. I shall finish up with a suggestion of which from those listed below, will likely find their way into my kit list for my Three Points of the Compass walk which shall start around 1st April 2018. Early enough in the year that just about any weather conditions could be experienced. I am primarily a low level walker. I am not a mountaineer. Any mountains I do ascend, I walk up. So please don’t take any of what works for me as any form of advice for yourself. While the principles are the same, actual gloves and mitts that work for me may not do so for you. My wife, for example, suffers cold hands. I can be happily wandering along in single digit temperatures with no hand covering at all while she is completely layered up. That said, when first setting off and before warmed up, or when a stiff cold breeze is whistling over the fens, marshes, off the sea or on the fell ridges, I am happily pulling on at least a thin pair of gloves. The most minimalist pair I have and now starting to get pretty tatty, is a thin pair of Extremities Windstopper gloves. Terra Nova has a huge range of gloved and mitts available under their Extremities brand, and these 37g gloves have long been a favourite of mine. No bells, no whistles, they fit my hands well, do not extend far up the wrist and provide just enough protection to keep the windchill from sucking all the heat from my digits. It is these you can see in the image above. Like so may other pieces of kit, these gloves have been refined and other features added over the intervening years. The weight and bulk on newer models has increased as a consequence and I struggle to find an equally simple product to replace my aged pair when they eventually give up the ghost. 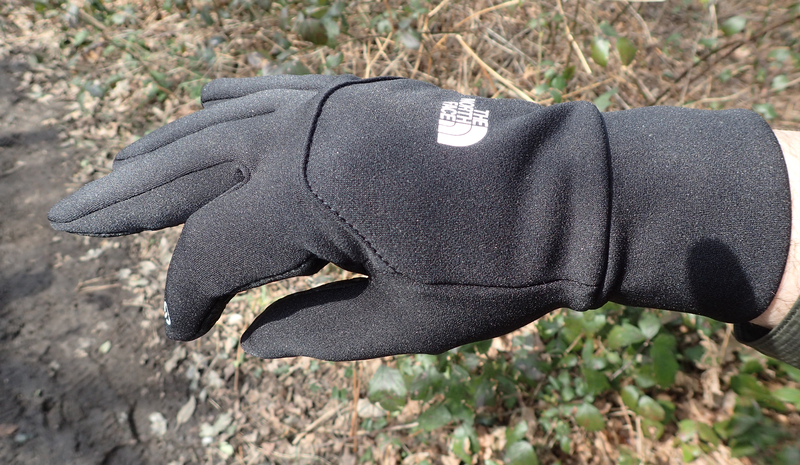 My XL 55g Etip gloves from North Face are a step up from the simpler Extremities Windpro. These gloves are higher specc’ed with silicone grippers across the palm, on the index and middle fingers and thumb. These enable an electronic device, phone etc., to be easily held in the hand.There is a longer cuff to stop draughts and in a nod to technology, comes with fingertip functionality to work with touchscreen devices. This works on all fingertips, not just the index finger as implied by the single symbol on the tip of that finger. I prefer the design of these gloves over many others as these do not have the silver coloured tip to the finger that looks like it has been dipped into a pot of paint. This is achieved by use of a conductive polymer applied to the fabric. I don’t know how integrated this is into the material or if it will wear or wash off over time. There have been some complaints that it washes off in the machine, but I have not been troubled this way as yet. 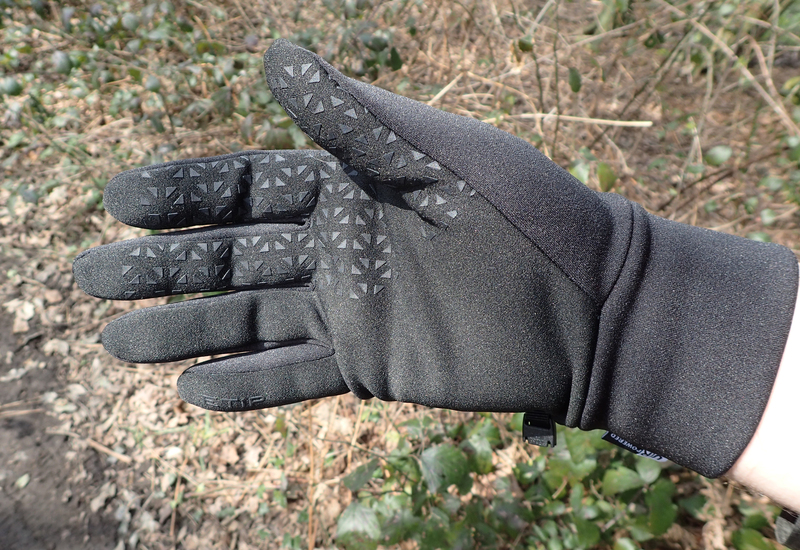 I haven’t really got a clue what TNF are rattling on about when they inform me that the stretch fleece gloves also come with- ‘a Radiametric Articulation™ and 5 Dimensional Fit™ for a natural fit‘. They are gloves right, I would expect them to articulate, and ‘five dimensions’! what on earth are they? Made in Cambodia, the gloves are 93% polyester and 7% elastane. Regardless of the bumf. These are good, comfortable gloves to use with walking poles, suffering less slip than the silicone deprived Windpros above. Because there is less slip, there is less need to grip so tightly, so less hand fatigue as a result. North Face themselves rate these gloves as being suited to a ‘mild climate’, however I believe they hold their own into cooler conditions. The longer wrist goes some way to pushing this boundary, though this can be rolled up if too warm. 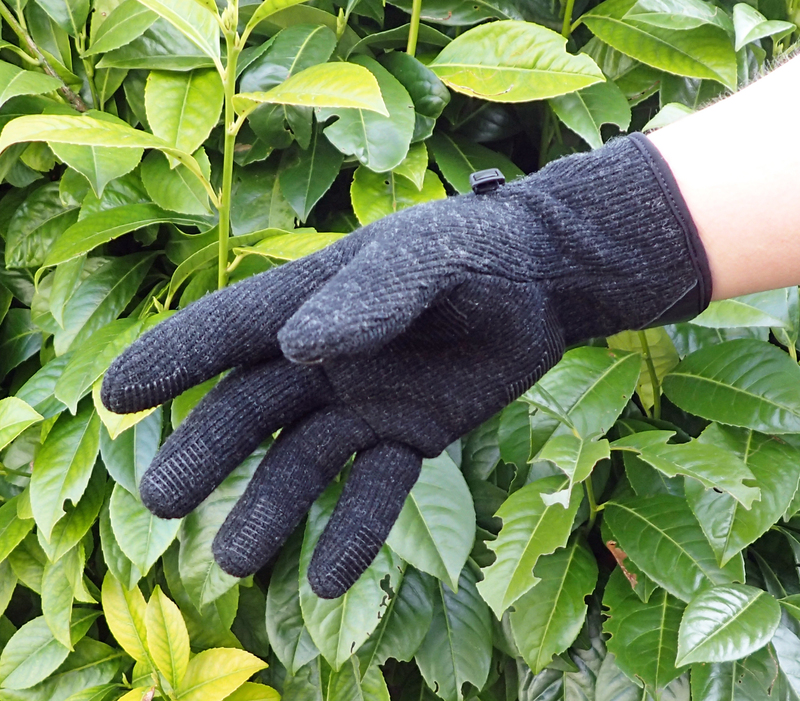 The thin fleece material does not provide too much insulation so they are more suited as liner gloves in colder conditions or should be replaced with something warmer. All in all, they mostly suit me for three season use unless the temperature really drops. I only wear these gloves when the temperature drops significantly. They are specifically designed for cold-weather trekking. They are warm obviously, but also provide good protection from the wind. If not actually windproof, they are very resistant. 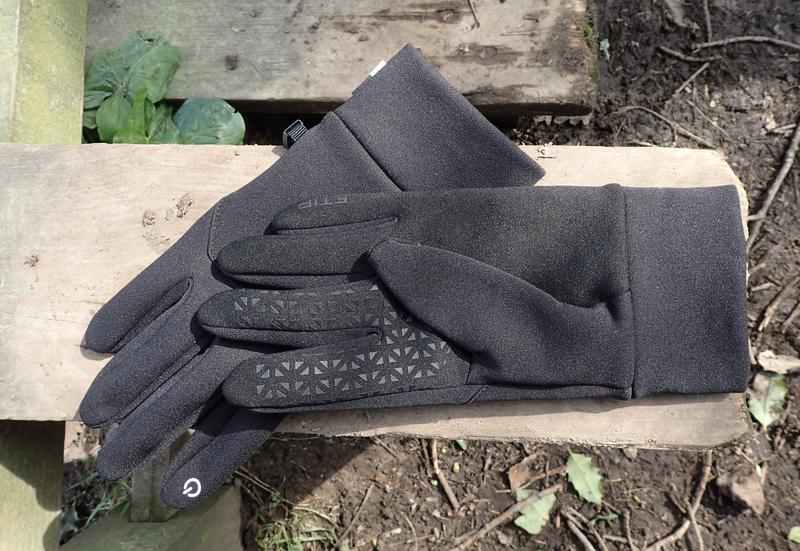 Made in China, the Flurry Gloves are made from what Outdoor Research call Alpin-wool Plus fabric. The wool/nylon exterior (11% nylon, 26% wool, 63% polyester) is intended to wick moisture away from the 100% polyester, soft fleece interior layer. They are snug on the hand have some silicone bars on the palm and finger tips to aid grip. There is a small leather ‘pull-on’ tab on the outside of the inner wrist as well that seems to be wearing well. These gloves are not waterproof and hold a lot of water when saturated. This squeezes out quite well but even when wet, a lot of insulation is still provided, probably due to the wool content. The cuff is a sensible length, not too short. Just inside the inner cuff on each hand is a good sized loop to aid in pulling them on or off. This can also be used to hang them from for drying. I like the addition of a plastic clip to clip the two gloves together even if I frequently forget to use it. I usually find these gloves too warm to use and as a result they are seldom put to use unless it is winter walking in sub-zero temperatures. 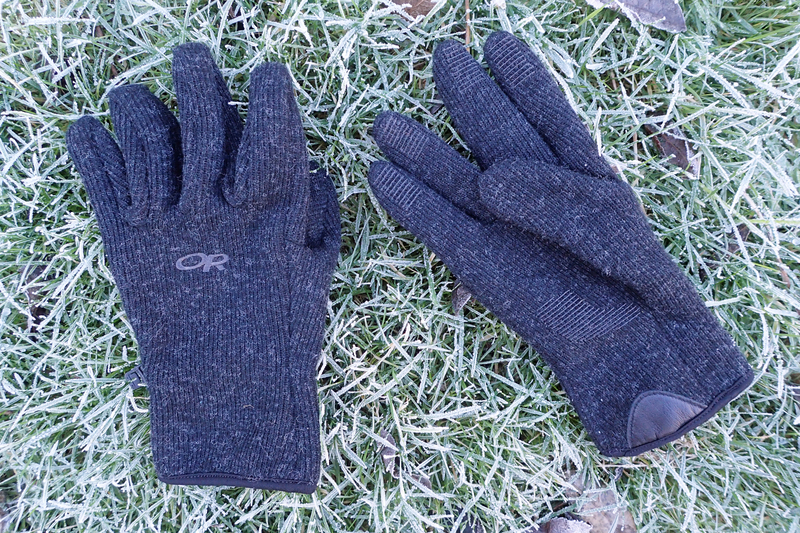 However they make a sensible choice as a spare pair to keep in the pack in winter should a primary use glove get lost. An XL pair weighs 78g. 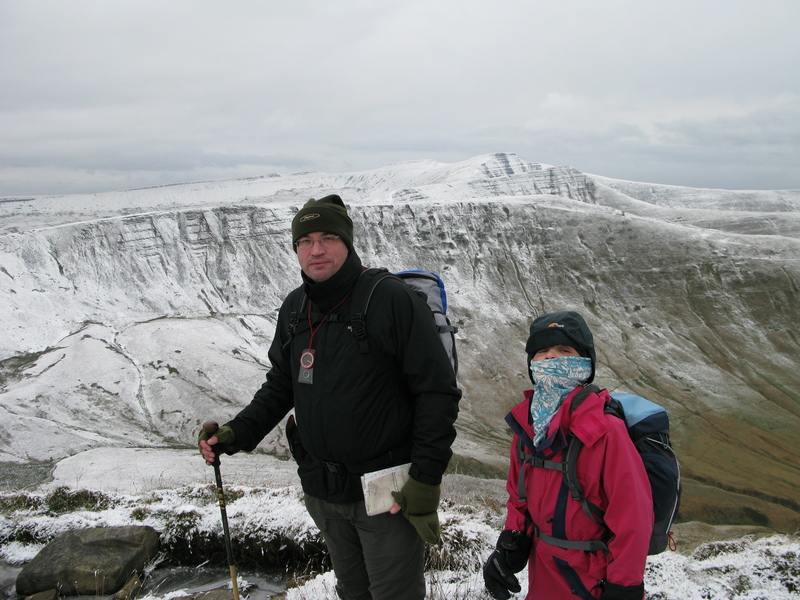 One simple piece of kit still finding space in my pack on many walks are my woollen fingerless mitts. Of some obscure generic manufacture, they are so Old School they could wear a mortar board with aplomb. But they are so damned good at what they do. 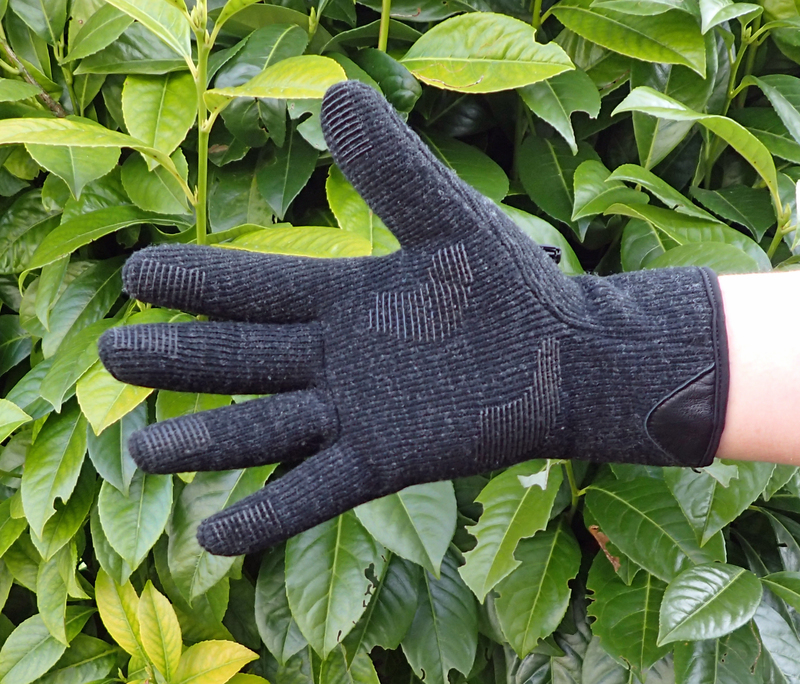 Wool keeps much of its warmth when wet, the fingerless feature when mitt and thumb are folded back provide quick and easy dexterity when required. They are (were) very cheap. The thin leather palm has been stitched back on a few times by myself and they have a couple of burn holes from the odd stove mishap. They work. However 103g is, unbelievably, too heavy to consider these days for longer hikes as there are lighter options. But for day hikes, they still have a place. I also have a simpler pair with no fold back thumb, no inner lining and no added palm. Likewise, they still do a good job, but do not stop the wind like this lined pair do. 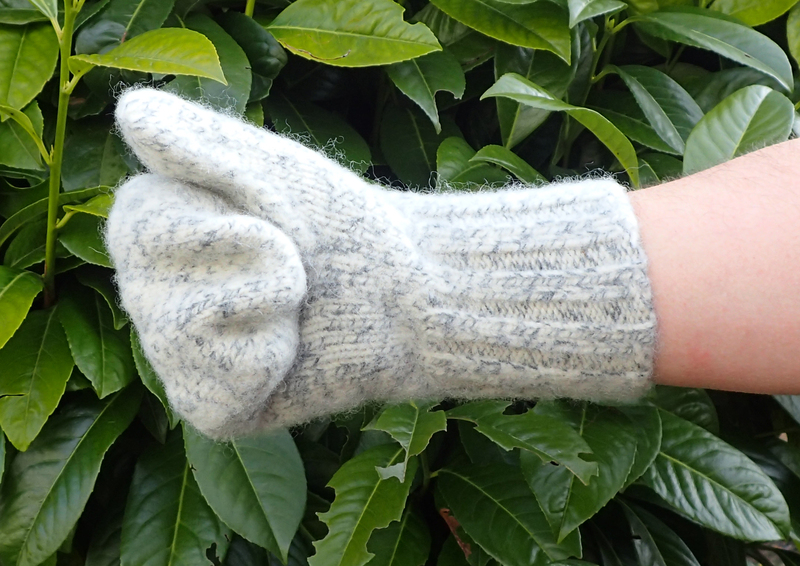 It is now possible to purchase synthetic versions of these fingerless glove/mitts. I might take the plunge one day, purchase a pair and see how they hold up. In colder conditions, mitts are warmer than gloves. The trade-off is a loss of dexterity. The majority of mitts available on the market are constructed from synthetic materials, some of those available are excellent products, though these can be an expensive option. A cheaper and almost as equal alternative is to include a pair of natural wool mitts in your arsenal. How about a blast from the past. Don’t laugh. 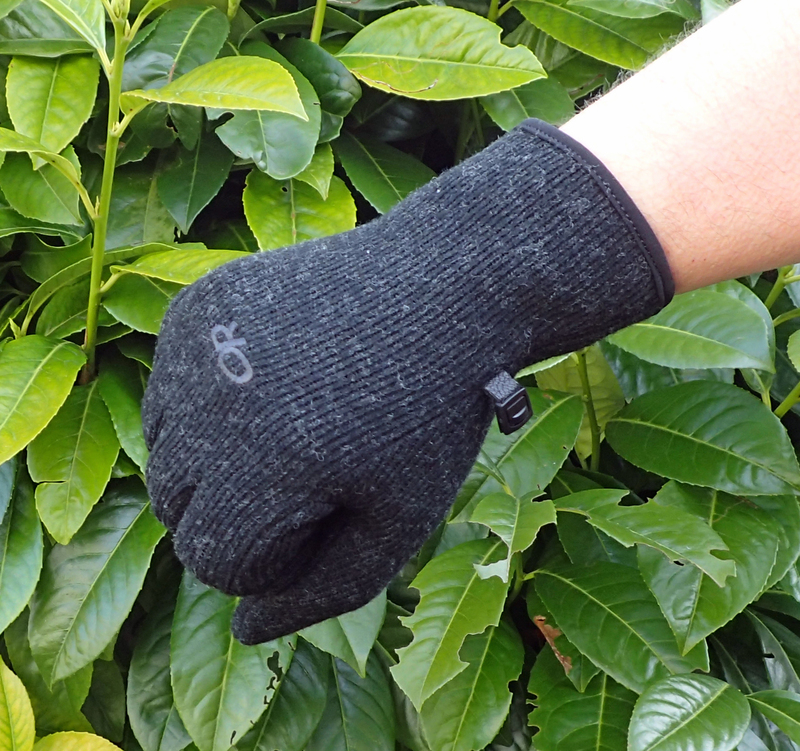 These simple boiled wool mitts from Dachstein Woolwear are an excellent choice for cold weather. 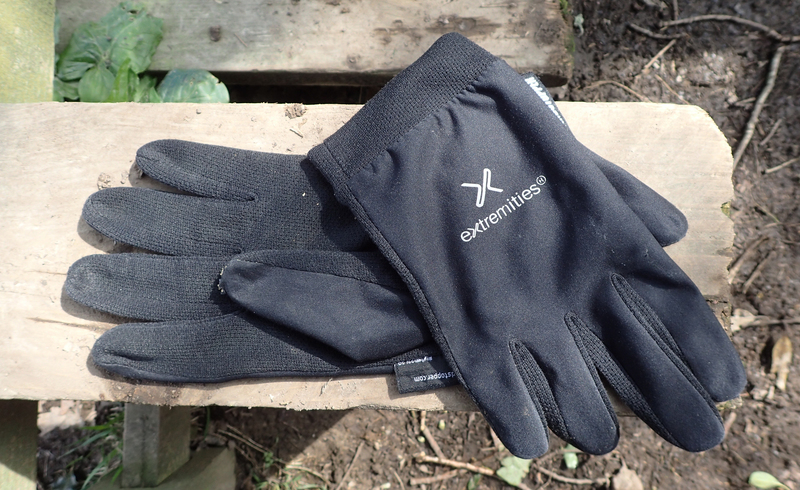 Used by Alpine climbers of yore that recognised a good piece of kit, these mitts can still hold their head up today. They are quite tight on the hand, fit could be described as ‘snug’, yet it is still possible to make a fist within them. These are amongst the easiest of mitts to get on and off when wet, others can be a bit of a pain as wet fingers stick to inner layers. 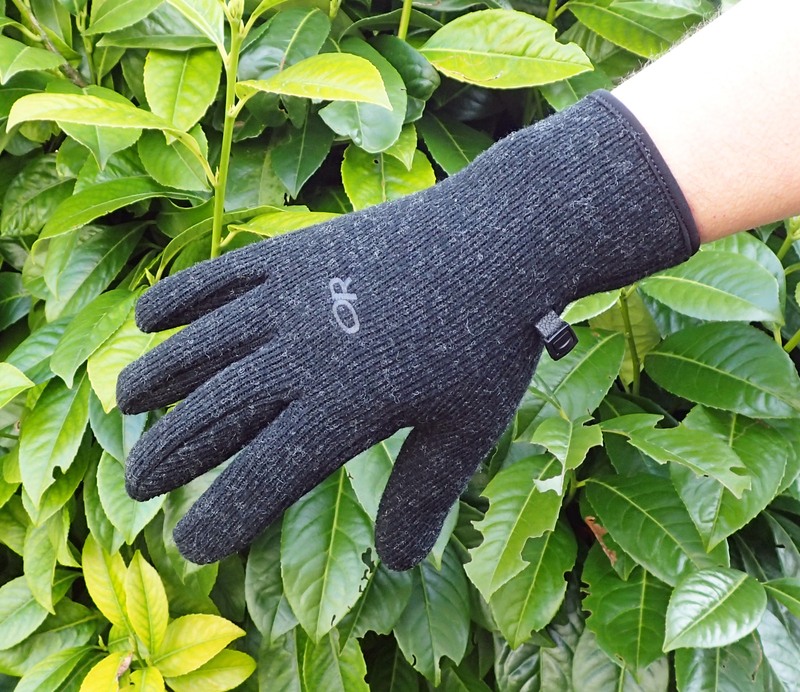 Some of the natural oil in the wool is retained after manufacture so they do exhibit some water resistance but there is no waterproofness exhibited with these woollen mitts. However it is simply enough to wring them out, and wet wool does retain some warmth. In driving snow, they are more effective as a layer of snow can build up on the outer fibrous layer, icing and forming a protective layer, but those are conditions that are in the minority. The long and quite tight cuff keeps the wrist warm. This is the area where blood flows close to the skin so insulating this area is important when the mercury drops. There are no silicone grippers on the palms so grip on poles is not fantastic. Being wool, they can wear with abrasion and holes can form though as yet I have had no problem with this. I do find that holes can appear more readily on gloves than mitts and a few minutes with a needle and thread are required to sorts things out. However, this is a form of repair not so easily effected on more technical, modern clothing made with synthetics. 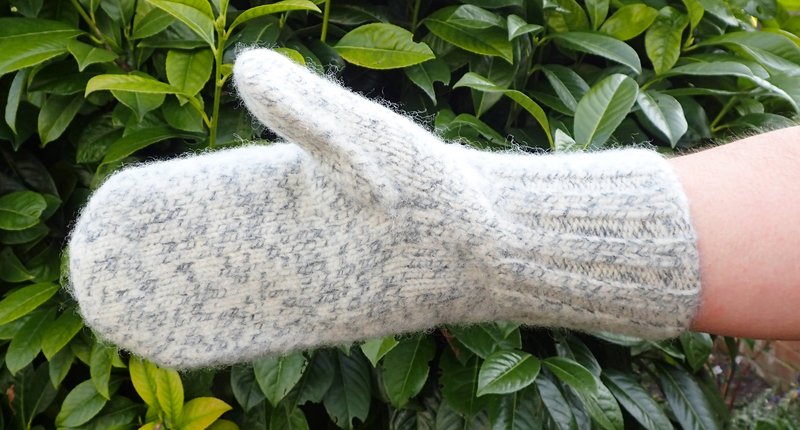 These mitts are not particularly lightweight at 161g (which is not ridiculously heavy for such warm items) so you may wish to think carefully before including them as a spare pair in the pack. Instead, a pair of woollen socks may suffice as simple over-the-hand woollen mitt type coverage if conditions deteriorate. But if sub-zero temperatures are the norm and snow is covering the ground, then it is easy to accept such a simple yet effective pair of mitts. 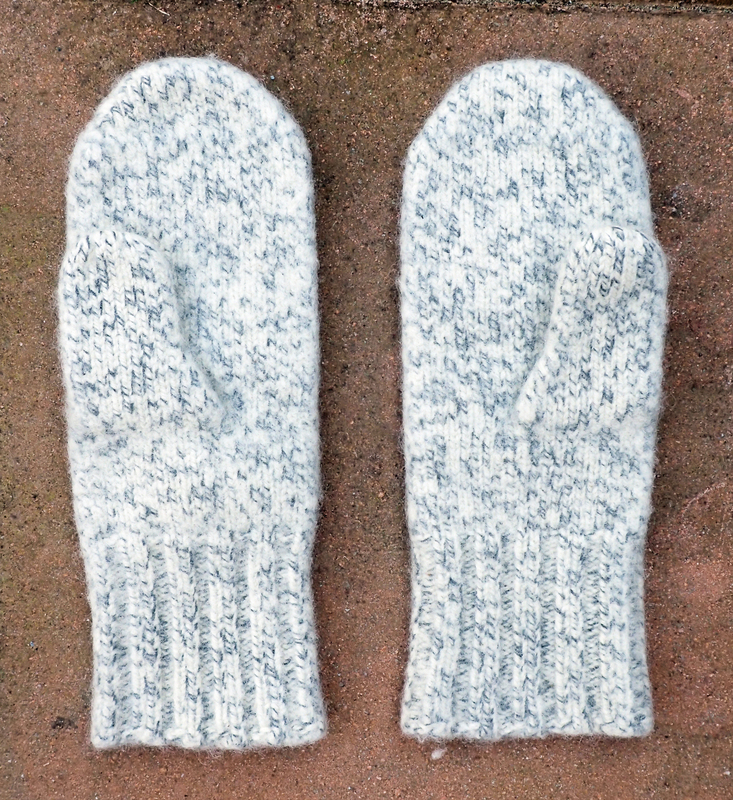 There is also a glove variant made by Dachstein in the same manner as these mitts. 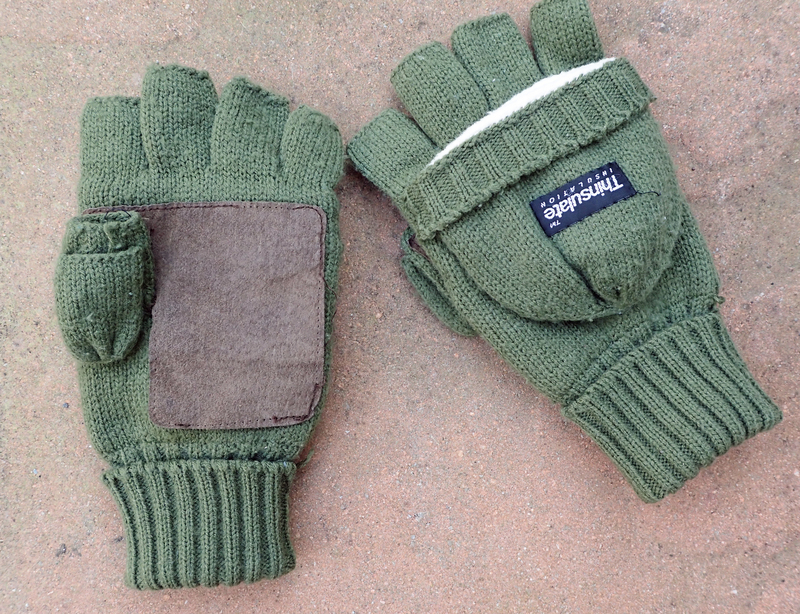 What I would like to get my hands on someday is the, impossible to find, Dachstein fingerless glove with folding over-mitt variety. The mitts are made from 4-ply strands of wool, boiled over a form so that they shrink to make a very dense and tight weave. These are warm mitts, very warm. They have been used by climbers at height for decades in conditions I will never experience. Yes, they are simply boiled wool garments, but they work. Full stop. 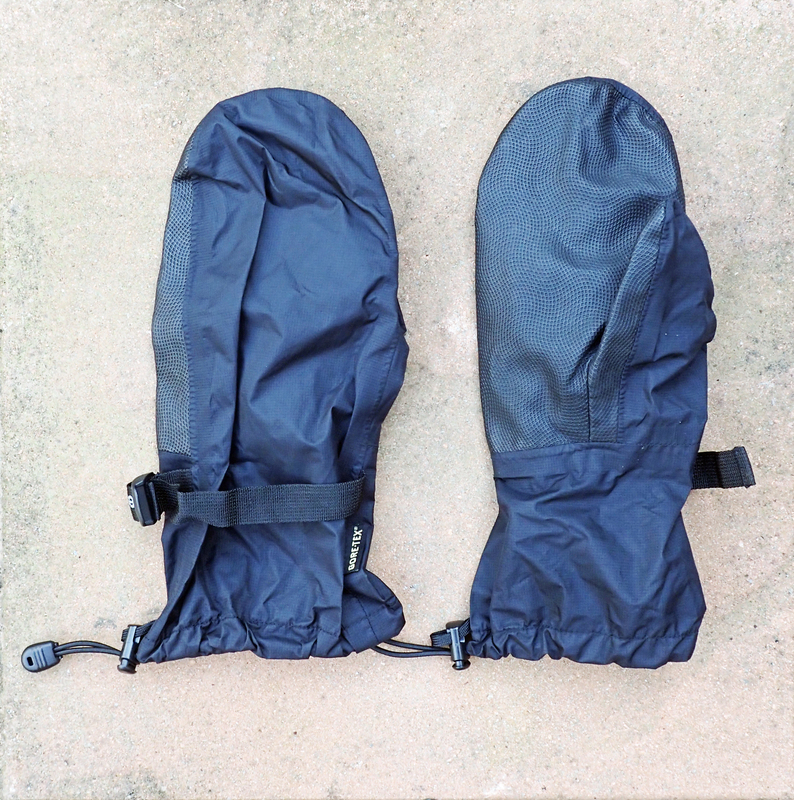 Good and simple as the Dachstein mitts are, I was keen to reduce the weight and looked to a modern alternative. 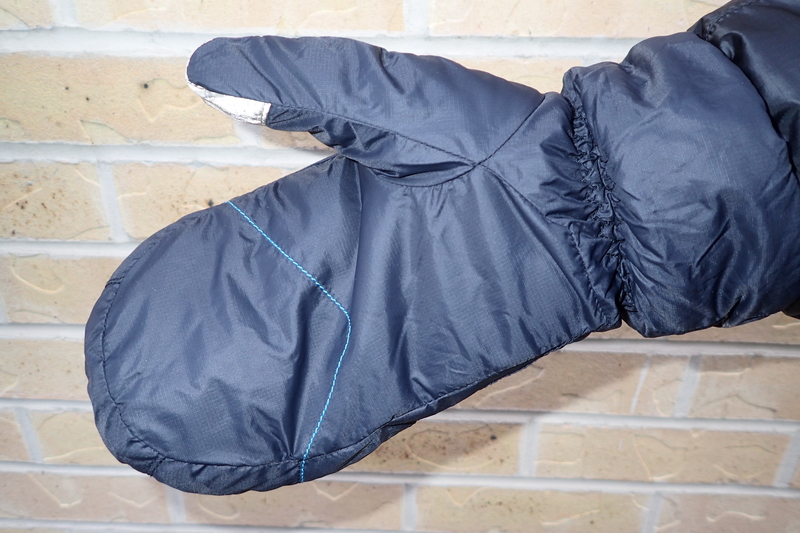 There a number of synthetic mitts made by many manufacturers. I settled on a pair from Montane. This company pride themselves on producing innovative, lightweight, breathable clothing and equipment for endurance sports and activities in extreme environments. I cannot argue with that, their products are superb. Their British made Prism Mitt is at the lighter end of their winter glove and mitt portfolio. 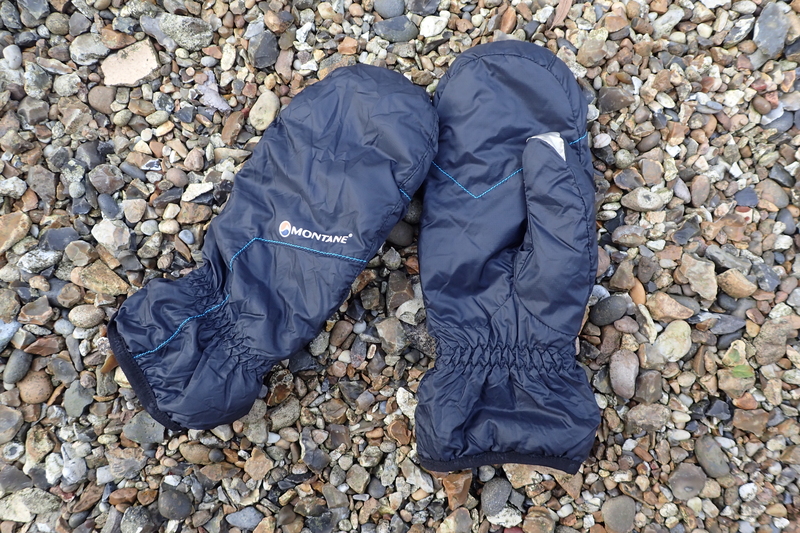 Montane have a range of hand-wear, some being similar to those first mentioned above. 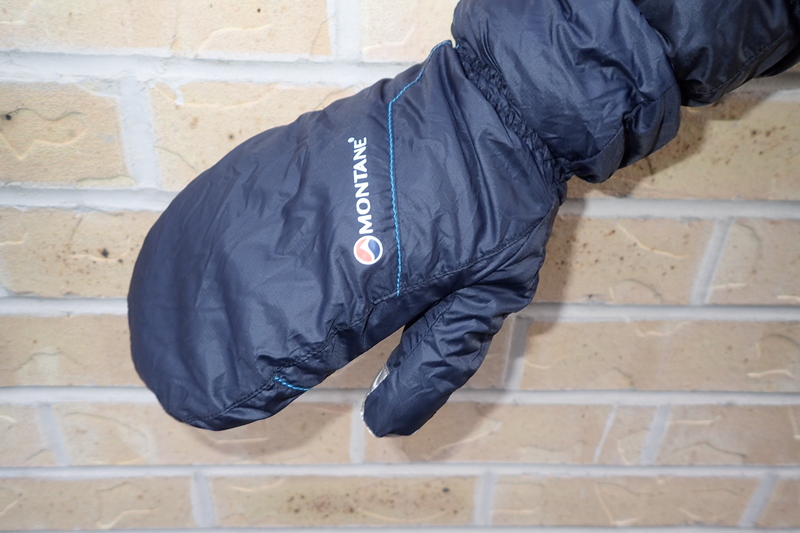 The Prism Mitt is an ultra-lightweight packable winter mitt with touch screen capability on the thumb. Excellent warmth to weight ratio is achieved by the use of lightweight modern synthetic materials- Primaloft GOLD insulation within a brushed microfleece lining and Pertex Microlight windproof outer layer. They pack very small. A stuff sack is provided with them but this need not necessarily be carried. A pair of XL mitts weighs 53g, the small stuff sack another 7g. So, a saving of 100g over the Dachsteins. These mitts are usually in my pack in shoulder and winter seasons ready to be puled out to either replace or compliment my lighter weight hiking gloves. 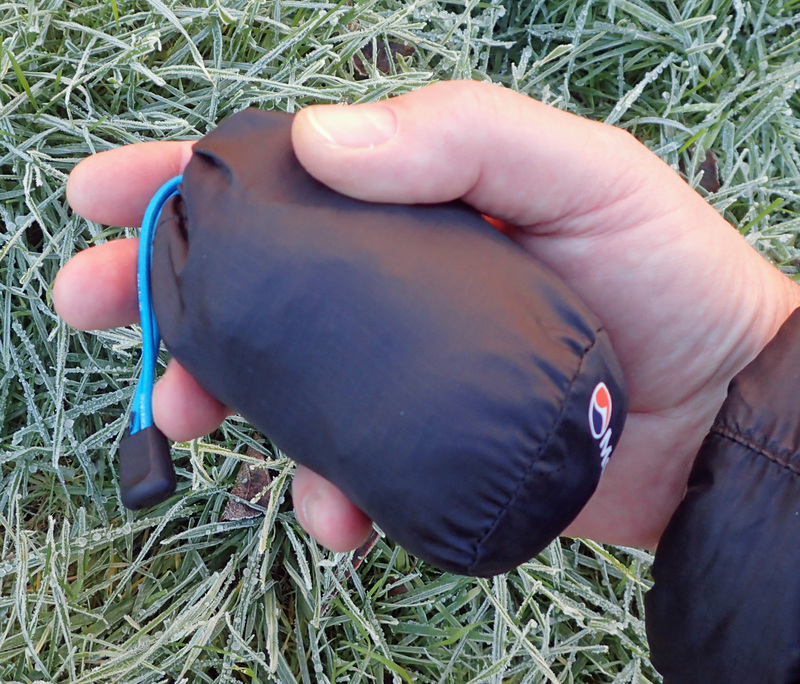 The mitts take up little room in the pack and their lightweight construction permits me to include these in a kit list where the heavier and far bulkier Dachstein mitts would be left behind. 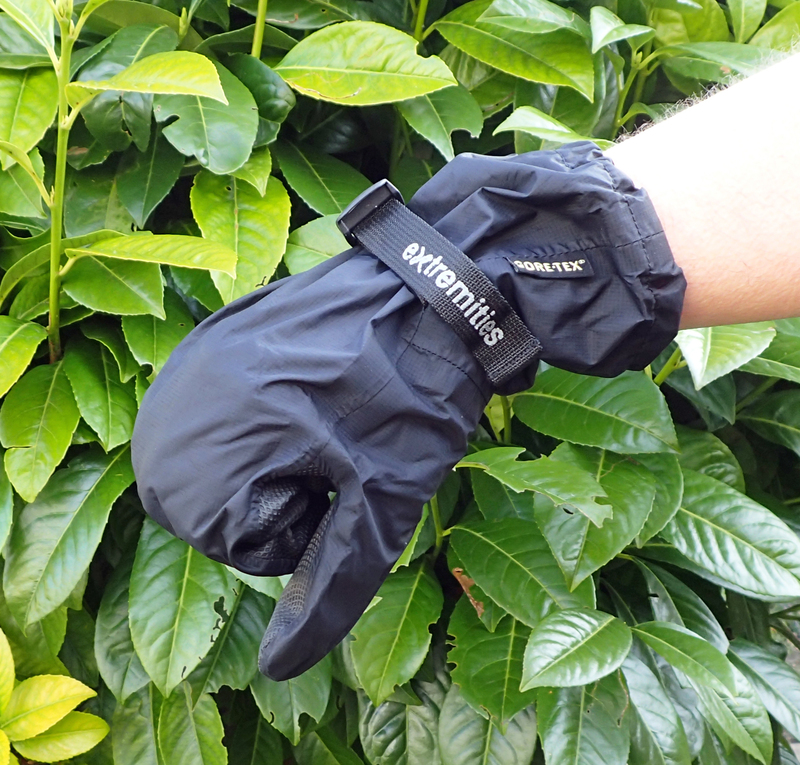 The Prism mitts are not waterproof but are water resistant and dry fairly quickly. I seldom put waterproof mitts or gloves on to keep hands dry. 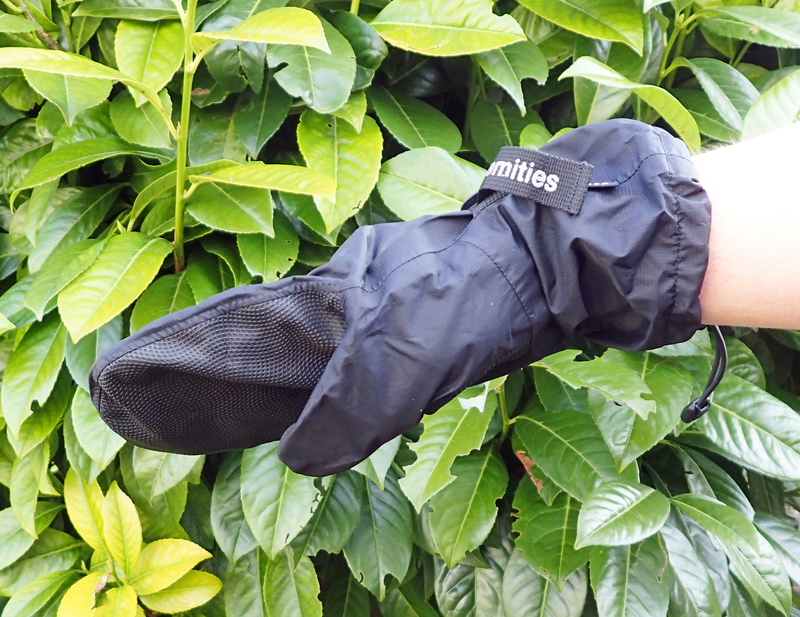 I have found they are of limited functionality- water runs down the sleeve and can enter, they can be a right pain to get on and off with wet hands sticking to the material and I frequently just pull waterproof jacket sleeves further down instead, to offer some protection, which is why I like waterproof jackets with long sleeves. However, in truly miserable conditions, a pair of mitts, rather than gloves can prove their worth. They can often be of more use when it is not raining; acting as a barrier layer for insulation purposes, effective windstoppers and allowing a warmer micro-climate to build up within them. 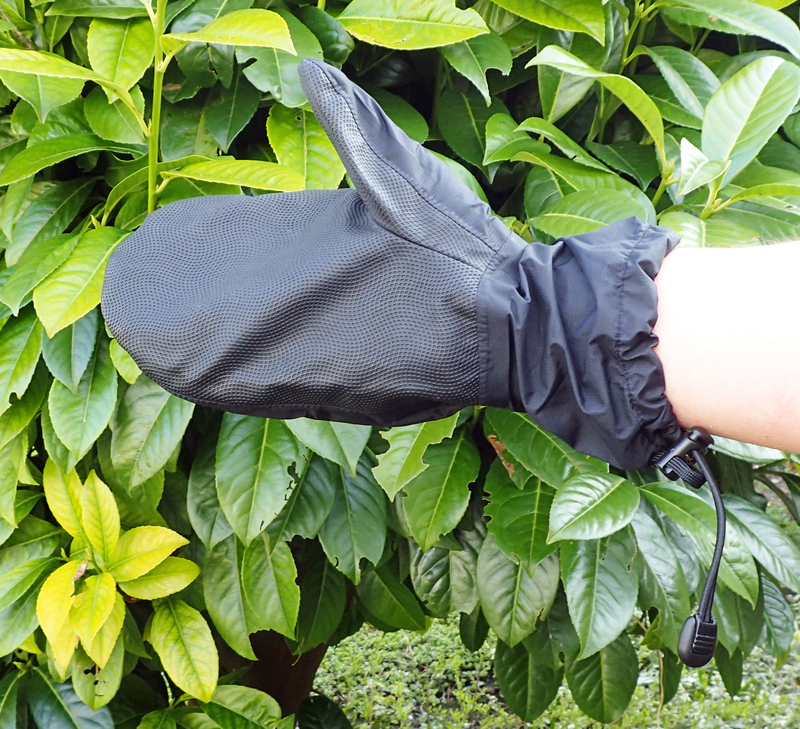 There are a number of more simple designs of waterproof mitt available. Some of the cottage industries, particularly in the U.S. produce minimalist, extremely lightweight products. Mine came from the Extremities range produced by Terra Nova. As previously mentioned, the Extremities range is extensive and there are a number of options. 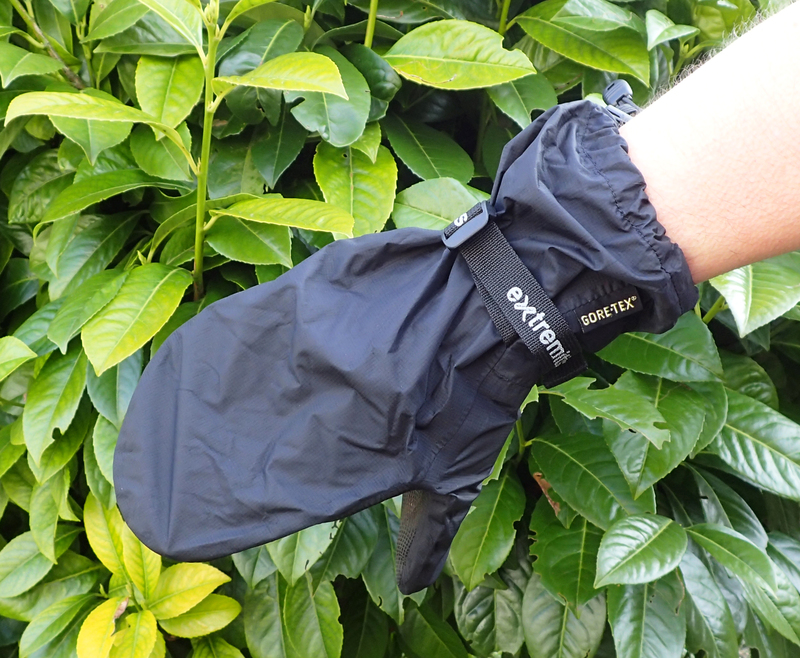 The lightweight Tuff Bags GTX are constructed from Goretex Paclite with a more durable PU palm and thumb. Terra Nova recommend their heavier-duty Guide Tuff bags with longer cuff and leather palm for use with walking and ski poles. However I have found these lighter weight mitts perfectly suitable to date. There is also an even lighter weight pair of mitts in the Extremities range that may suit inclusion in a lightweight set-up where extremely infrequent use of waterproof mitts is anticipated. The wrist straps can be tightened with the teeth which can be handy, however the upper wrist drawcords will require greater dexterity to tighten. In practice it is extremely seldom that I tighten these. These mitts come up quite large so whereas I normally have an XL size in gloves and mitts, a size L fits me well. A pair of size L weighs 83g. So- what is Three Points of the Compass taking on his Long Walk? I am attempting to keep the weight down, so much as I am fond of the woollen offerings, these simply weigh too much for me to include. Which means synthetic. To this end, I shall take the 55g North Face Etip gloves. If necessary, I can roll the cuffs off the wrist if too warm, they provide the necessary protection from windchill, but equally important, the silicone grips will help limit hand fatigue when trekking with poles in the cold. However these are not warm enough in themselves if the mercury really drops. I could pull a spare pair of socks over my hands, but the fantastic Montane Prism Mitts at just 53g will do a far more efficient job. That leaves the question of waterproof gloves and mitts. I have long thought on this and have decided not to take any. 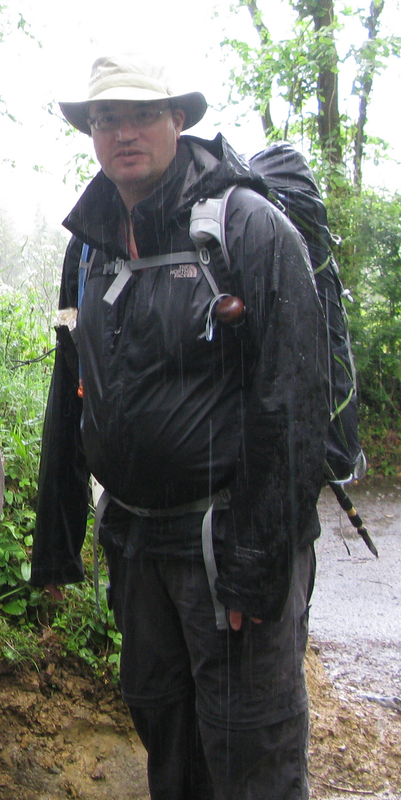 I have hiked many hundreds of miles in the rain and waterproof gloves always leak eventually and waterproof mitts eventually get wet inside just by having to take them off and on for various tasks over a long hike in the rain. So good as the Extremities mitts are, they are staying at home.